I imagine I will still be reeling from my week in the desert for some time, so please forgive me if my brain is still somewhere in Nevada for a few days. If you’ve been my friend for a long time, you might know that I used to be a vocal major & I sang quite a bit of opera. It was then that I became familiar with Samuel Barber, who is probably best known for writing Adagio for Strings, which is often referenced as the saddest song in the world. I however, am rather partial to “The Desire for Hermitage”, which was written by a monk and found in the margins of an illuminated bible, then later set to music by Barber. I sang this song atop Babylon, a 100ft high tower out on the deep playa, at 3am. It was one of the most moving experiences of the entire trip. 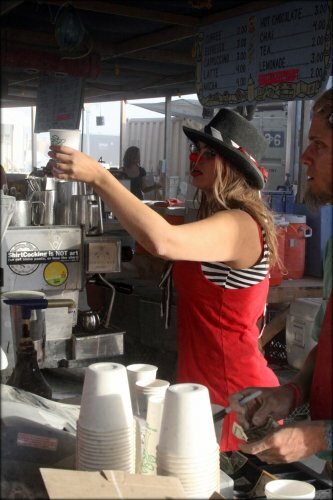 Anywhere I can serve people lattes wearing a clown nose gets a thumbs up in my book. Also: dance breaks. The lovely lady behind Four Eyed Monsters. It’s always nice to shake the hands of folks bringing great art into the world. Reuniting with old friends is a joyous thing indeed. During one of several total whiteout dust storms, I did a modern dance improv piece at center camp. We were at about 5 foot visibility at the time, so only people who were very, very close could see me. I rolled around in my red & black kimono, got dirtier than I’ve ever been in my life, and inhaled the dust as I danced until my lungs were raw. It’s a feeling I can’t properly describe. Much like Burning man in general. I’ll have another BM update with video whenever I have time to edit it down. 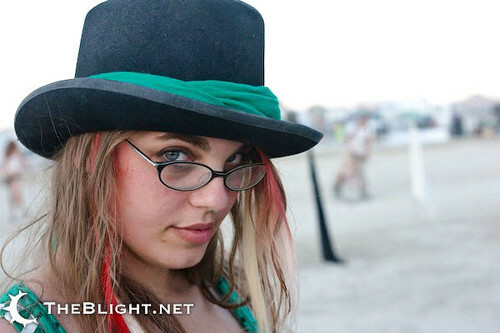 Awwwww….I am on an open univerity system at SJSU so I couldn’t go this year, because a condition of OU is showing up the first week (coniciding with Burning Man) I kept watching all the videos on current.com & they made me sad. I believe I am going to an after-burn party tomorrow (lol POSER) & then some hippie thing in GG Park on Saturday.